Fun fact about me: I love award shows. I pretty much love all of them (except the Grammys…that’s not my jam). And guess what was just on? !…The Golden Globes. Of all the award shows the Golden Globes are my fave…it combines everyone worth seeing. TV stars: check. Movie stars: check check. Random musicians: they got’em (I’m looking at you TSwift). Those ladies, those dresses…THAT FACE! I LOVE IT! Goop is NOT entertained you guys…. …I love all of it. So obviously I needed to gather than gang to watch this biz last weekend. Plus, its Tina and Amy; how can you NOT watch when they’re hosting? I decided to make some golden globes for the golden globes….do you see what I did there?…such a clever girl. 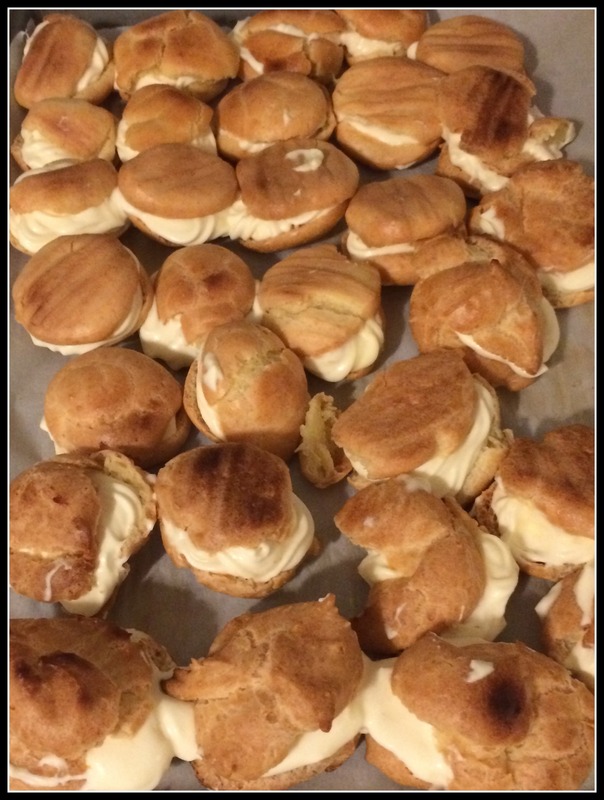 I decided to whip up some home made cream puffs…also some chips and dip and sangria because…well every party needs a beverage. 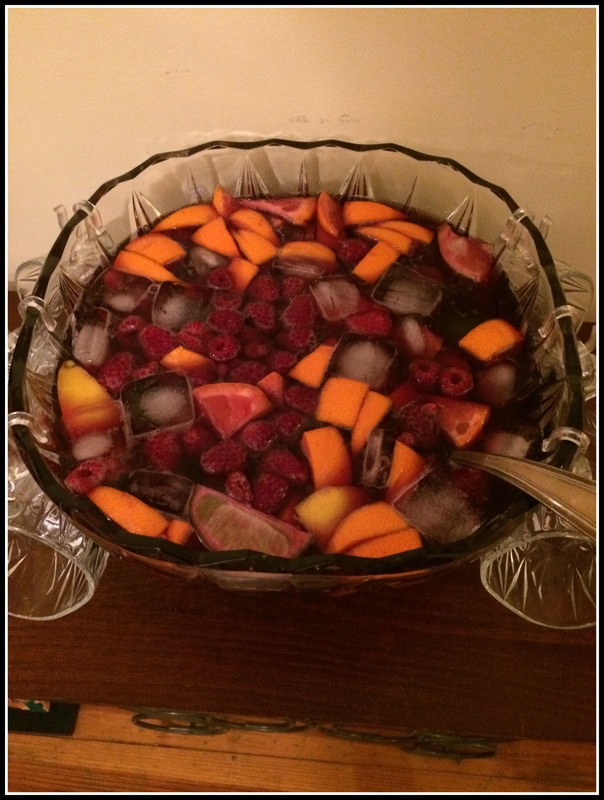 Party Punch! check out this super simple recipe! But back to the cream puffs. So for Christmas my Gram got me an electric cookie press (poorly named because it does soooo much more than make cookies). 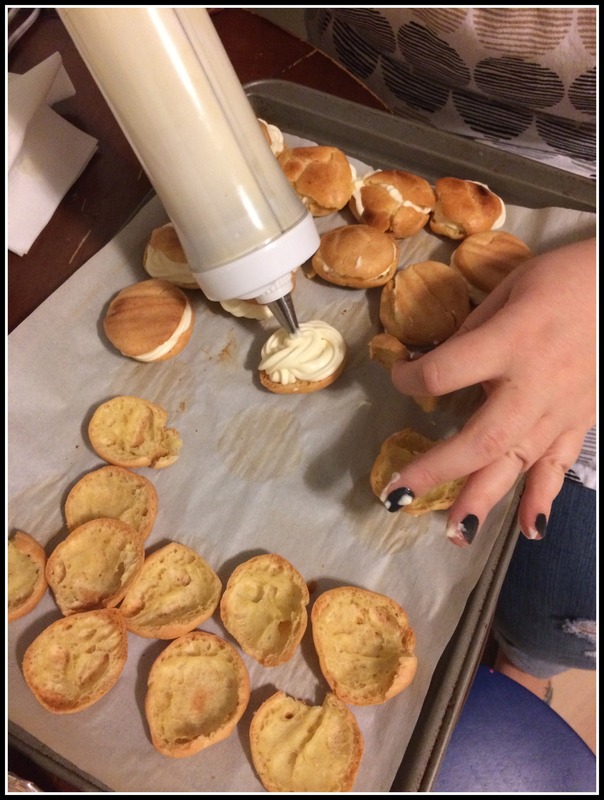 Said cookie press makes things like cheese crackers, cream puff, cookies, it frosts cupcakes and fills cream puffs…that kind of thing. 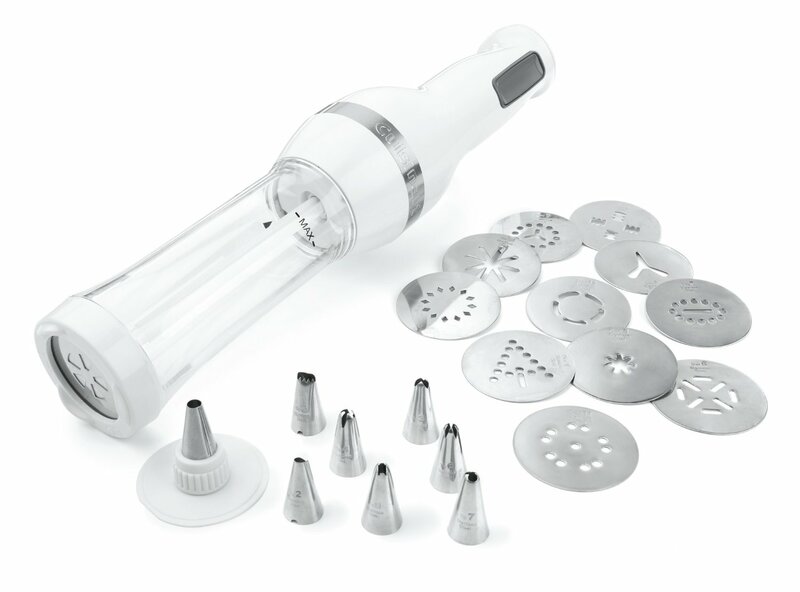 This beast is so much more than a cookie press…. I’ll be honest, it did not go smoothly. Making the puffs themselves is actually pretty simple…except I messed it all up almost immediately. I misread the recipe and like tripled the flour…which incidentally was exactly how much flour I had at the time, meaning I had to RUN to the store for more and restart the dough. The press came with a little recipe booklet with some decent recipes in it…which is where I got the recipe for the puffs. Combine 4 Tbs butter and 1/2 c. water in a pan. Take off heat and add 1/2 c flour. Mix it up until it cools. 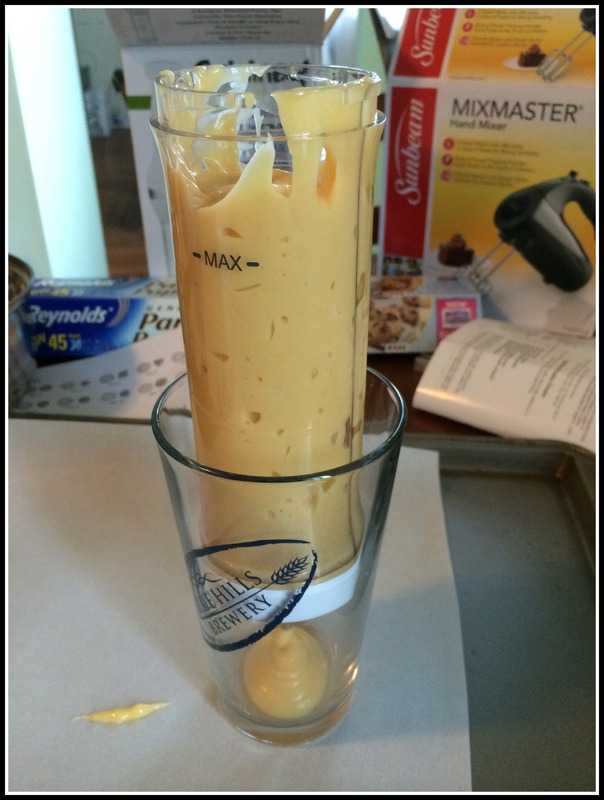 Beat in 2 eggs one at a time until smooth (like a thick cake batter). Use the press (or spoons) to make 2 inch-ish blobs on your parchment paper lined cookie sheet. I had a few issues. 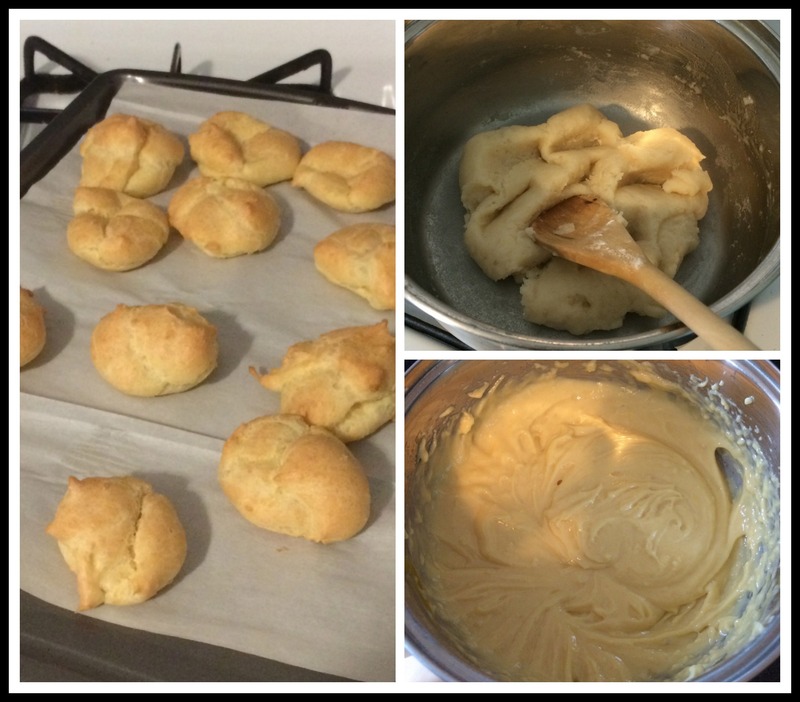 The recipe have the wrong baking temperature…so my puffs deflated a bit (womp womp). You need to preheat the oven to 500F, then turn the heat OFF and put the puffs into the hot over for 10 mins. Then turn the heat up to 375 for about another 20 mins. The primary issue I had was with the press itself. The design of this thing is ridiculous. It’s VERY difficult to fill the press with only yourself…1. it leaks out the tip 2. you have to either put the press in between your legs or (as my gram suggested) use a cup to hold it while you fill it. To me, this is a MAJOR flaw because the time and frustration it took for me to get the first batch of puffs in the over was insane. Ain’t nobody got time fo’ this sh**. See what a mess this is?! You can see how much leaks out the bottom. I swear I called my gram no less than 3 times that fateful Sunday when I undertook these globes. I want to love this press but we’re going to have to get to know each other better before I attempt to make anything again. To make the filling I simply used a box of vanilla instant pudding (made with 1/2 c less milk) mixed with some homemade whipped cream. See ya next year ladies.